Wu Qingyun was from Nanjing, but lived and worked mostly in Shanghai, and also spent some time in Japan. He is considered by some to have developed Western stylistic features in his paintings, most evident in his use of chiaroscuro. This, however, might instead be the influence of the early Qing dynasty (1644-1911) painter Gong Xian (1618-1689) from Nanjing. Wu Qingyun is known for imitating the works of Mi Fu (1051-1107), the master calligrapher and landscape painter from the Song dynasty (AD 960-1279). Mi Fu's landscapes always depict the cloudy and misty hills of the Jiangnan region in South China through large wet dots of ink. In this painting, the artist inscribes how he is ‘Imitating the brushwork of Mi Fu’. 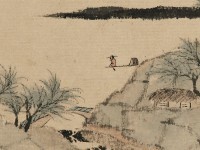 The year of Wu Qingyun's birth is unknown, though his earliest dated work is from 1857. He was from Nanjing, but lived and worked mostly in Shanghai. He spent some time in Japan and is considered by some to have developed Western stylistic features in his paintings. This is evident more in his use of chiaroscuro, in which he may anwyay be indebted to the earlier Qing Nanjing painter Gong Xian, than in any use of perspective.